Several important institutional investors (with BRL 1.8tn AUM) have signed the ‘Brazil Green Bonds Statement’, an initiative of the Climate Bonds Initiative (CBI), Principles for Responsible Investment (PRI) and SITAWI Finance for Good. The statement highlights the signatories desire to see the growth of a strong Brazilian green bonds market, sets out specific actions conducive to achieving this and aims to foster discussion and future issuance of these bonds in the local market. 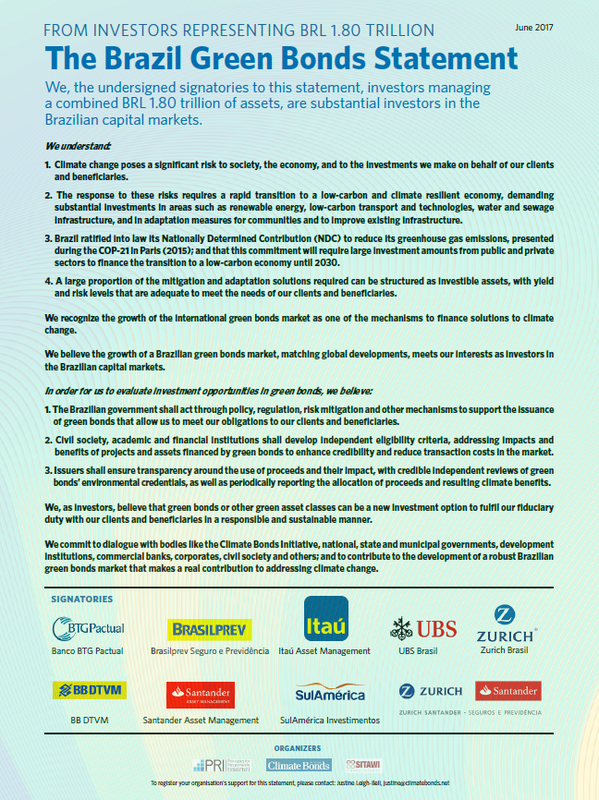 Based on a global declaration signed in 2015 by investors at the Paris COP21 UN Climate Conference, the Brazilian Statement adds local context, with input from market participants, including fund managers, insurance companies and pension funds. Banco BTG Pactual, BB DTVM, Itaú Asset Management, Santander Asset Management, SulAmérica Investimentos and UBS Brasil signed the statement on October 2016, during the launch event of the ‘Guide to Green Bond Issuing’ in Brazil, in São Paulo. In June 2017, three more institutions - Brasilprev, Zurich Brasil and Zurich - Santander - signed the Statement committing to the transition to a sustainable local economy.